The quarterback had to learn his third new scheme going into his fourth NFL season. The Titans are leaning on a lot of young receivers and coordinator Matt LaFleur’s experience calling plays grows with each game. The changes, along with the loss of three-time Pro Bowl tight end Delanie Walker in the opener, led to some early struggles on offense. Now Mariota is feeling comfortable enough with the offense and LaFleur to speak up when the game plan features something he doesn’t like. “Having confidence in it, being in the offense a little longer has definitely helped that,” Mariota said. 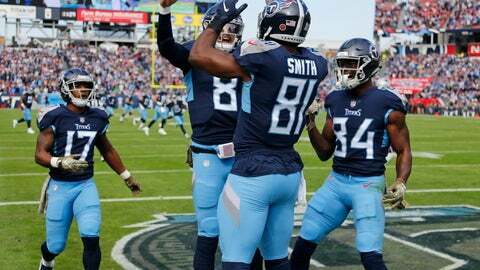 The results might not show up in NFL rankings with the Titans (5-4) 30th in total offense and 18th averaging 18.7 points a game. The offensive turnaround started Oct. 21 in London in a 20-19 loss to the Chargers and includes a 28-14 win in Dallas and last weekend’s 34-10 rout of the Patriots. In those three games, the Titans have converted 61 percent (25 of 41) of their third downs, which is best in the NFL in that span. Notes: LB Wesley Woodyard was named the AFC defensive player of the week after 1 ½ sacks against the Patriots. … LB Derrick Morgan (shoulder) and RT Jack Conklin (concussion protocol) were limited Wednesday at practice along with S Dane Cruikshank (knee). LG Quinton Spain (ankle), WR Taywan Taylor (left foot), G/C Corey Levin (illness) and RB David Fluellen (knee) did not practice.